I'm having an issue with my header in X theme. I just have the written text header, and it looks great on desktop, but on a mobile it doesn't resize automatically, so it's huge. Is there any way I can do this? will add site in private msg. The website you posted does not use Pro. Please use Pro so we could check the issue. Pro builder's output are responsive but in some areas like if you use the Navigation Inline element, you will need to hide it on mobile using the Hide During Breakpoints feature. After that, you can add a Navigation Collapsed element and hide this element on desktop. 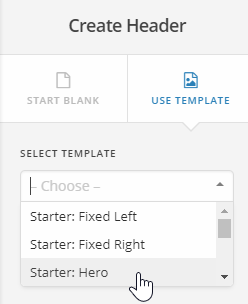 Try importing the Hero starter header template to see how it works and then you can follow the setup. Also check out more Pro theme usage instructions in our Knowledge Base for more tips and tricks.